In the afternoon R[ichard] told me that he had been thinking about the bloody lance in Parzival and had been led by it to the Greek mysteries. agner was fascinated by classical Greece. In particular, he was interested in two aspects of the ancient Greek culture: firstly in the social and religious role of the Greek theatre, and secondly in the myths that had provided the content of Greek poetry and drama. Myths were, as Wagner expressed it in Oper und Drama, true for all time . It was the task of the poet to create art from the inexhaustible content of myth. n 1849 Wagner sketched his own drama on the subject of Achilles (WWV 81). It was probably while reading about this hero of the Trojan War, that Wagner encountered the story of Achilles and Telephus (Τελεϕος). elephus, son of Heracles and Auge, was a king in Asia Minor. After nearly making the same mistake as Oedipus, of marrying his own mother, Telephus married a daughter of King Priam. As an ally of the Trojans, his kingdom was attacked by the Greeks (or Achaeans) and in the fighting, Telephus was wounded in the thigh by the spear of Achilles. After the Greeks had withdrawn, Telephus' wound would not heal. he Greeks had no leader who could show them the way to Troy. But Telephus, because his wound was unhealed, and [the oracle of] Apollo had told him that he would be cured when the one who wounded him should turn physician, came from Mysia to Argos, clad in rags, and begged the help of Achilles, promising to show the course to steer for Troy. So Achilles healed him by scraping off the rust of his Pelian spear. Accordingly, on being healed, Telephus showed the course to steer, and the accuracy of his information was confirmed by Calchas by means of his own art of divination. A marble relief from Herculaneum. Achilles scrapes rust from his spear into the wound of Telephus. razer notes that the spear was the famous one which Chiron the Centaur had bestowed on Peleus, the father of Achilles. The shaft was cut from an ash-tree on Mount Pelion, and none of the Greeks at Troy, except Achilles, could wield it. 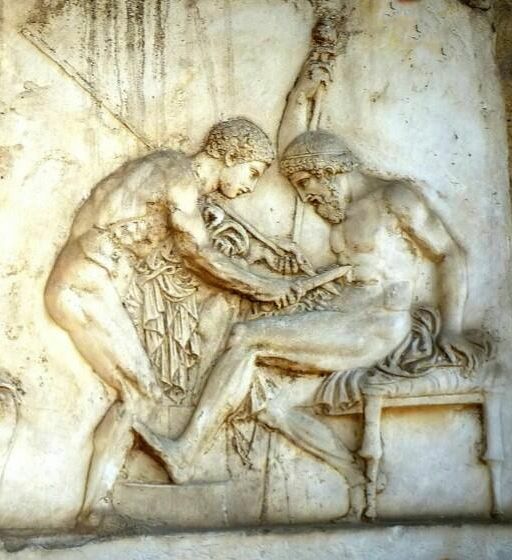 The healing of Telephus's wound by Achilles was the subject of a play by Sophocles, called The Assembly of the Achaeans (of which only a tiny fragment survives), and one by Euripides (also lost) called Telephus (438 BC). The poet tells us of a spear which yet Might cure the wound that it itself had dealt If friendly hand were but to place it there. his myth provided an important element in Wagner's Parsifal. When reading the medieval Grail romances, in which a number of different spears appeared, it would seem that Wagner recalled the wound of Telephus. He might even have seen the reference to a spear that relieved the pain of Anfortas, although it did not heal him, in Wolfram's Parzival, as a remnant of the almost forgotten myth. By the time he wrote his Prose Draft in August 1865, Wagner had decided to make the spear that caused the wound into the instrument with which the enlightened fool would heal the wound. He was still uncertain, however, about how to deal with the magic weapon. Had it been given to Titurel at the same time as the Grail, or had Klingsor found it for himself? The lance has been entrusted to the knights at the same time as the Grail. When trouble presses hard it is even borne into battle by the Keeper of the Grail. Anfortas, in order to break Klingsor's magic, which is so fatal to the knights, has taken it from the altar and set off with it against the arch-foe. Succumbing to seduction, he let shield and spear fall, the sacred weapon was stolen from him and used to wound him as he turned to flee. (Perhaps Klingsor is anxious to have Anfortas in his power alive, he commands the lance to be used against him, knowing that it wounds but does not kill. Why?) The healing and deliverance of Anfortas is now logically only possible if the lance is rescued from impious hands and reunited with the Grail. On being entrusted with the Grail, the knights were also promised the lance: only it must first be won by hard fighting. Were it one day to be united with the Grail, then nothing again could assail the knights. Klingsor has found this lance and is keeping it, partly because of its powerful magic -- it is capable of wounding even the godliest of men if any fault attach to him -- and partly to withhold it from the community of the Grail, who by winning it would become invincible. Anfortas has now gone forth to deprive Klingsor of this lance: seduced by love, he is wounded by Klingsor's hurling the lance at him. -- The continuation now remains the same: it must come into the knights' possession. -- Klingsor hurls the spear at Parzival; he catches it; he knows about it, knows its power, its significance. The Theft of Fire, by Christian Griepenkerl. 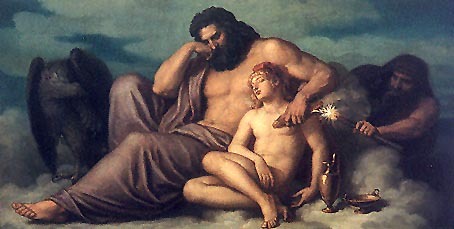 Prometheus steals fire from Zeus. n 28 February 1877, Richard gave Cosima to read the second Prose Draft of Parsifal, which he had just completed. She recorded her reactions in her diary: This is bliss, this is solace, this is sublimity and devotion! -- The Redeemer unbound! rometheus, like Amfortas and Telephus, had a wound that would not heal. As punishment for Prometheus giving fire to man, Zeus had him chained up in the Caucasian mountains. Every day, an eagle came to Prometheus and bit him in the liver, which grew again every night. In his Prometheus trilogy, of which only Prometheus Bound has survived, Aeschylus developed him into the creator and saviour of mankind. Although he gave them fire, Prometheus took away their knowledge of the future. In the next part of the trilogy, Prometheus Unbound, Zeus allowed Prometheus to be freed. Heracles shot the eagle and freed the titan from his chains. R[ichard] says to me, "Prometheus' words, 'I took knowledge away from Man' came to my mind and gave me a profound insight; knowledge, seeing ahead, is in fact a divine attribute, and man with this divine attribute is a piteous object, he is like Brahma before the Maya spread before him the veil of ignorance, of deception; the divine privilege is the saddest thing of all." 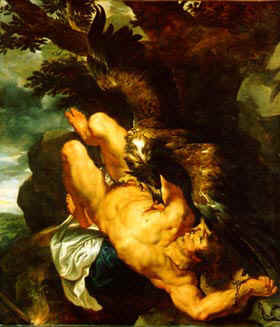 Right: Prometheus and the Eagle, by Rubens. rometheus, unbound, appeared on the title page of the first edition of Friedrich Nietzsche's first book. The ideas presented in that book, The Birth of Tragedy, were either ideas that originated with Wagner, or which Nietzsche developed during and after conversations with Wagner. Nietzsche contrasted the myth of Prometheus with the Biblical myth of the Fall. Prometheus, a male character, committed sacrilege by stealing from divine nature. His was an active sin. Eve, a female character, allowed herself to be deceived. Hers was a passive sin. To Nietzsche's observations might be added, that through Eve's fault mankind gained the knowledge of good and evil, whereas through Prometheus' actions mankind lost the knowledge of the future. n Wagner's letter to King Ludwig of 7 September 1865, he suggests ( but with considerable caution ) that Adam-Eve-Christ might be compared to Amfortas-Kundry- Parsifal. The analogy is certainly not an exact one. It seems that Amfortas' sin was an active sin, like that of Prometheus, and he too was punished with an unhealing wound. Kundry is not tempted, as was Eve, but rather she is a temptress. The common theme is knowledge. One day there arrives a young man whose distinguishing characteristic is his lack of knowledge. Parsifal lacks even the knowledge of good and evil; perhaps he represents pre-fallen, paradisiacal human, still in a state of dreaming innocence?